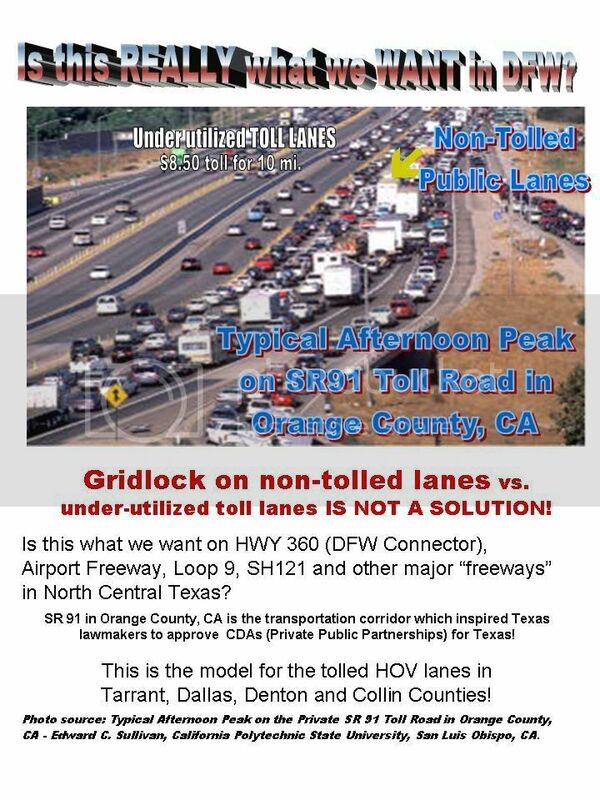 Terri Hall- TURF - April 27, 2012 (Austin, TX) - We've seen it with AIG's toxic debt, then the banks with their financial crisis spawned by subprime mortgages, now get ready for the next big bailout -- the toxic debt from toll roads. 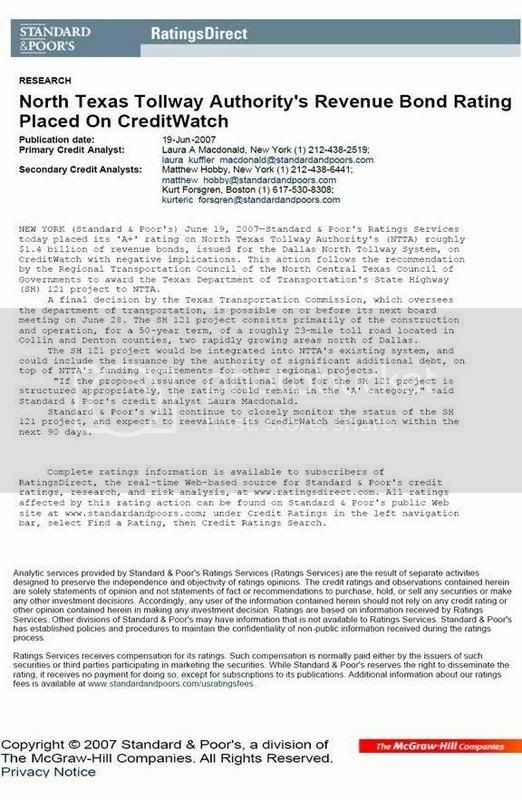 The Texas Transportation Commission engaged in a day-long lovefest at its April 26 Commission meeting idolizing themselves and like-minded leaders from around the state for indulging in 'leveraging' Texans to the hilt and demanded even more debt. 'Leveraging' is code for tolling (and now it can also include local revenue streams like property taxes and sales taxes). Their message is clear: no toll roads, no local debt, no money. All this despite the fact that the State of Texas is more than $34 billion in the hole for roads already. Federal data shows Texas is second only to New Jersey in road debt in the country. The bubble that shields Texas Governor Rick Perry's five appointees to the Commission from direct accountability to the taxpayers allows them to display such a gluttony of anti-taxpayer sentiment. Likewise the rules are the same for the un-elected directors of the Metropolitan Planning Organizations of the four major cities in Texas: Austin, Dallas, Houston, and San Antonio that TxDOT trotted out today, and they, too, joined the anti-taxpayer bandwagon. Their motto: put the screws to the taxpayer openly, and often in every conceivable tax & debt scheme no matter the cost or long-term consequences. This attitude dominates virtually every Commission meeting since Perry took office. Perry's largely been able to get away with such behavior from his appointees. Transportation Commissioner, Ted Houghton of El Paso, brazenly called himself "the most arrogant commissioner of the most arrogant state agency in the State of Texas" at a press conference announcing TxDOT pulled the plug on a major Trans Texas Corridor project, TTC-35, due to the threat of litigation back in October of 2009. Rather than punish him for such arrogance, Perry promoted him to Chair of the Commission when long-time crony Deirdre Delisi bolted to run Perry's failed presidential campaign in 2010. Commissioner Ned Holmes opened the meeting with high praise for leveraged debt, and he later received adulation for selling-off Texas' sovereignty by handing some state highways in Houston to private corporations in sweetheart toll road deals called public private partnerships (P3s), despite their higher cost, complexity, and lack of efficiency. Commissioner Bill Meadows then hailed Dallas officials for using leveraged debt to advance $15.3 billion in transportation projects, most all of them toll roads, including thanking the federal government for yet more leveraged debt by giving them a $450 million TIFIA loan to slap tolls on Interstate-35, Texas' major NAFTA highway through the state. Toll rates won't be cheap either -- 85 cents a mile -- and this new tax rate will be in the hands of a private corporation whom taxpayers cannot hold accountable. Traditionally, turnpikes didn't involve taxpayer money, but rather toll revenue bonds. Private bond investors took all the risk if the traffic didn't show up to pay tolls and they were brand new roads offered as alternatives to freeways. Now under Perry, 'innovative financing' techniques introduced by the likes of Goldman Sachs (responsible for the debt crisis in Greece), the taxpayers are heavily subsidizing toll projects, most of them on existing freeways. The federal TIFIA loan program is one such slush fund for toll projects, many of them propping up privatized toll roads in P3 deals, making TIFIA loans that much more egregious. "So Meadows doing a shout-out to the feds, whom Perry is so fond of slamming, demonstrates just how fiscally reckless Perry's highway commission is, despite Perry's claim to a fiscal conservative pedigree," notes Terri Hall, Founder of Texans Uniting for Reform and Freedom. "This debt bomb is what so-called fiscal conservatives that run Texas want to wreak upon unsuspecting Texans for generations," Hall stated in disbelief. "I've noticed there's a tsunami of leveraging." "Taxpayers and commuters weary from high gas prices had better wake-up and hold the Governor, lawmakers, and local elected officials accountable for their fiscal 'tsunami,' or they'll soon be overtaken by it with no turning back," warned Hall. TURF is a non-partisan, grassroots, all-volunteer group defending citizens' concerns with Agenda 21, toll road policy, public private partnerships, and eminent domain abuse. TURF promotes pro-taxpayer, pro-freedom, & non-toll transportation solutions. For more information or to support the work of TURF, please visit www.TexasTURF.org.